Alf attends Yate National School, reluctantly. He finds the war very exciting and hopes that school will soon be closed for good. He supports the war effort by picking blackberries and collecting eggs to be sent to wounded troops, and gathering conkers for cordite. This work is especially satisfying as the children are given half days off school to carry it out. His father, Harold Pyke (32), is serving in 12th Glosters “Bristol’s Own”. He enlisted in 1914, one of the first men to join the battalion. Keen to do his bit for his country, he writes home whenever he can and usually asks for a parcel to be sent as this is his one luxury. Alf’s mother, Anna Pyke (28), works hard to keep the house together while her husband is away fighting. She makes money by taking in soldiers as lodgers but is worried she will have to find work in a local factory as she is finding the food shortages hard. His younger sister, Catherine Pyke (7), is often off school to help her mother keep house and look after their soldier lodgers. Catherine is a talented knitter proud of her Empire Day certificates awarded for the socks she has been knitting. 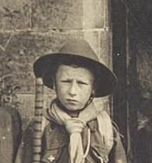 Alf is a member of 1st Chipping Sodbury Scouts and delivers messages on his bicycle for visiting troops (including North Lancs and Bristol’s Own in Chipping Sodbury) and occasionally the local police hoping to earn a War Service scout badge. Alf hopes to become a Sea Scout and travel to the south coast of England to work on the coast watch. Please note that characters created in @theSomme-sg are fictional. However, real images are used for illustrative purposes only.